People differ in the ways they think. When approaching an issue such as immigration, some analyze the problem logically, relying on facts and theories. Others draw on their personal experiences and stories they have heard. Presidential candidates are no different. By identifying how the current round of presidential hopefuls think, we can predict how they will go about making decisions if they are elected. One way to identify thinking styles is to use computer-based text analysis methods to analyze everyday language. Based on earlier research, we have found that analytical thinking is revealed though the high use of nouns, articles, and prepositions. The use of these parts of speech indicates that the speaker is identifying conceptual categories and organizing them in hierarchical ways. At the opposite end of the spectrum are people who are more narrative or dynamic thinkers. Narrative thinking is linked to low use of nouns, articles, and prepositions and high use of pronouns (such as I, she, they, it), auxiliary verbs (is, have), common adverbs (so, really), and related small common words called function words. Interestingly, the more a person is an analytical thinker, the less he or she is a narrative thinker and vice versa. Across multiple studies, analytic thinking has been linked related to intelligence (as measured by standardized tests such as the SAT), better performance in classes across the college curriculum, and better education in high school. Analytic thinking is also more common among leaders, older (as opposed to younger) age, and people with better health habits. Narrative thinking is more common among younger, more impulsive, and sociable people. Whereas analytical thinkers like to break down and analyze a problem, narrative thinkers prefer to relay their own experiences and tell stories to understand the problem. Analytical thinkers weigh more facts; narrative thinks rely more on intuition and snap judgement. Using Daniel Kahneman’s language, analytic thinkers would think slow and the narrative thinkers would think fast. Across this season’s debates, we have been analyzing analytic/narrative thinking to identify how each candidate naturally thinks about the world. As the Iowa caucus grows closer, it is revealing to see how the candidates from both parties are adjusting their thinking to appeal to their audiences. Before looking at the individual candidates, it is interesting to see how the thinking styles within the Republican and Democratic debates have differed. Note that numbers above 50 are generally considered to reflect more analytical and logical thinking. Numbers below 50 are tend to be more narrative, personal, and immediate. Overall, the Democratic debates are associated with more formal and logical thinking than the Republican debates. More interesting are the trends. Whereas the Democrats are becoming more logical and formal over time, the Republicans are becoming less formal and more narrative and personal. Why? Very likely the two groups are becoming increasingly familiar with their base — especially in Iowa and New Hampshire. When the Democratic candidates show up to a town hall, a disproportionate number of their supporters know the issues, listen to NPR, and expect reasoned answers. The Republican candidates are trying to appeal to Tea Party supporters who rely more on Fox News and Rush Limbaugh for information. For many, hard data is less persuasive than compelling stories. Another explanation can be attributed to a phenomenon called language style matching. Social psychologists have long known that people naturally mimic one another in the ways they behave, use nonverbal behaviors, and the ways they talk. Daniel Romero and his colleagues find that people who match others in a debate or negotiation are seen more positively than those whose speaking styles are unrelated to others. Other studies suggest that lower status people tend to mimic people with higher status — often unconsciously. Among the candidates, one might expect that the frontrunners would set the linguistic tone and that the followers would match them. As depicted in the graphs below, the patterns support the language style matching and status predictions — especially for the Republicans (the Democratic candidates are strikingly similar across all the debates). So how do the Republicans compare to each other and how have they changed as individual candidates? As the graph below demonstrates, the candidates’ thinking styles relative to each other have remained largely the same. Although the Republicans overall have become more informal across debates, there are some interesting differences between the candidates worth noting. Donald Trump has become more and more informal since the second debate in September. While Trump started the debates similar to fellow candidate, Ben Carson, his language has drifted further and further away from the other candidates as the debates have progressed. Trump remains an intuitive rather than an analytical thinker far more than his fellow candidates. Research suggest that someone with this type of narrative thinking style may be more impulsive when making decisions. Ben Carson hasn’t changed much over time. Since the first debate, Carson had been relatively informal and narrative focused. Carson is concerned with his political story without thinking too much about the logic or rationale behind his ideas. Carson’s language style has become somewhat more like Trump’s (whose top spot in the polls likely gives him the more status) over the across the debates. Also like Trump, his thinking style may be associated with more rash decision making. Marco Rubio is in the middle of the pack suggesting he is relying on both analytical and narrative thinking. While Rubio is working on his political narrative, he also is looking at the rationale behind it. Rubio’s thinking style has remained relatively stable across debates suggesting he may not perceive any of the other candidates as necessarily having higher status. 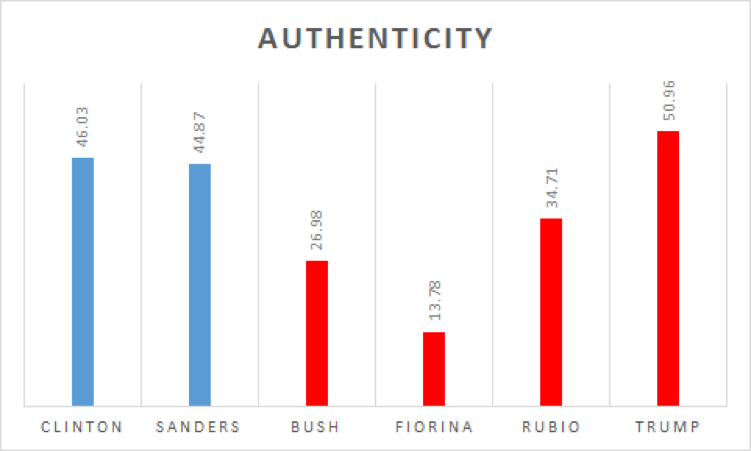 Jeb Bush is quite similar to Rubio though Bush falls more on the analytical side. Bush tends to focus on the logic behind his plans. 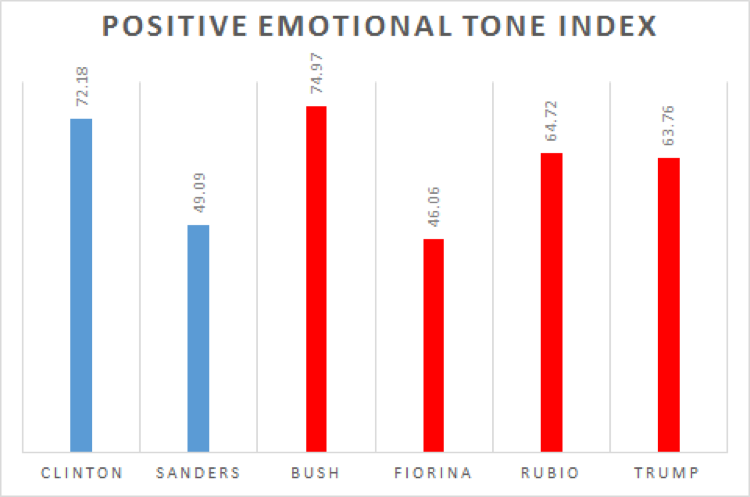 Like Rubio and Carson, Bush’s linguistic style has been mostly consistent through the debates. Ted Cruz has become less analytic in the debates since September, but he is still the most logical thinkers on the Republican side. His analytic language reveals a deliberative, though not necessarily better, decision making style. As Cruz has climbed in the polls, his thinking style is getting more in line with the other Republican frontrunners. At first, Cruz stood apart from the others but over time has become more similar to them. What about the Democrats? 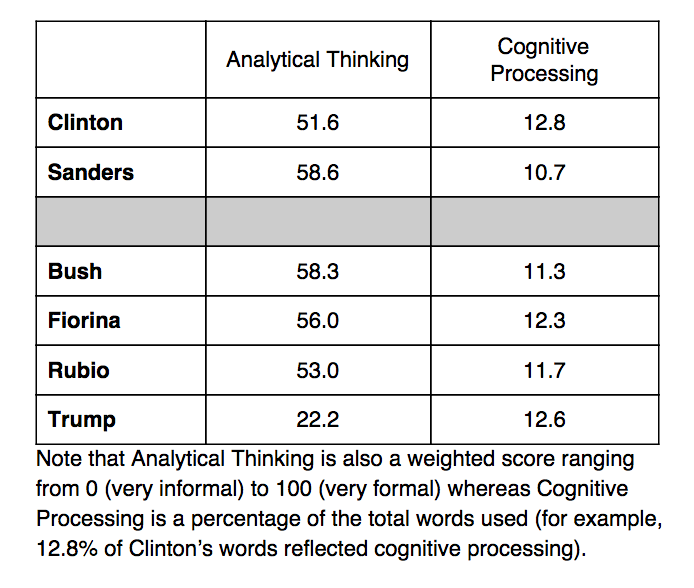 Both Democratic candidates are more analytic thinkers. Throughout the debates, their thinking styles have been similar suggesting they are on the same page and approach problems similarly with only minor differences across the debates. Bernie Sanders is an analytic thinker and has been relatively consistent across debates with only small increases since the first debate. Sanders is focused on his plans for the future and on the logic behind those plans. Hillary Clinton has become more analytic since the first debate catching up to Sanders in the last debate. In the first debates, Clinton had more balance between logical and informal thinking, but as the race has become slightly more competitive, she has become slightly more analytic. The current analyses suggest that both parties may be modifying their strategies to better appeal to the voters in the upcoming caucuses. Within the Republican party, the race has changed substantially since the first debate with all the frontrunners gaining or losing ground. In order to gain or regain support, candidates may have needed to change their approaches. Cruz and Trump have changed thinking styles the most and are the current leaders in most polls suggesting they may be the most responsive to these changes in circumstances. Rubio, Bush, and Carson, on the other hand, have changed less indicating that they might be less flexible and responsive to changing circumstances. Within the Democratic party, while Sanders has gained some ground, the race has not changed substantially. The mostly stable competition could indicate that neither candidate have felt compelled to really change the way they are approaching their campaigns. After the Iowa Caucus, the candidates have six more opportunities to face each other in debates. We will continue to examine how these candidates compare to each other and how they may approach the presidency as voters begin deciding which two candidates will battle for that office.